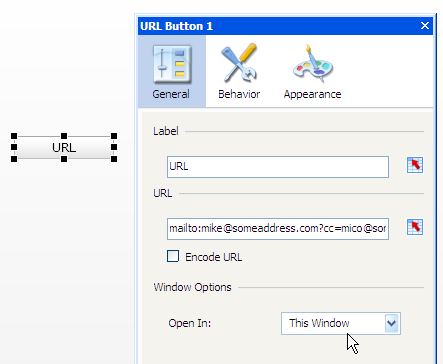 Prevent that awful Browser window from popping up when sending an email from Xcelsius. 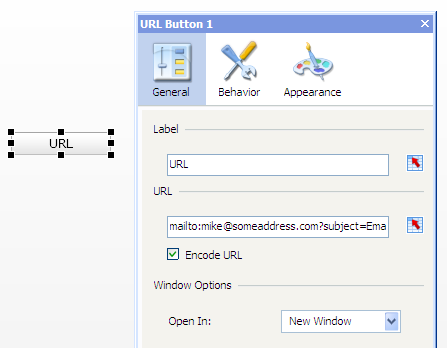 This will start a basic email when URL button is pressed. The email will have the To line filled in and the Subject line filled in. OK, let’s get fancier and add a body. mailto:mike@someaddress.com?cc=mico@someaddress.com&bcc=ryan@someaddress.com&;subject=Email To DataPig&body=I ate too much salmon. If you need to add a multi-lined body (meaning the text of your body is on multiple lines), you can use your own carriage return encoding %0D. 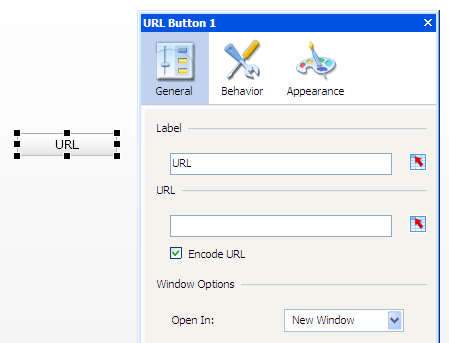 To be able to use this, you will need to uncheck the “Encode URL” option. This will tell Xcelsius that you will handle the encoding. mailto:mike@someaddress.com?cc=mico@someaddress.com&bcc=ryan@someaddress.com&subject=Email To DataPig&body= I ate too much salmon.%0DNow I have salmonella. 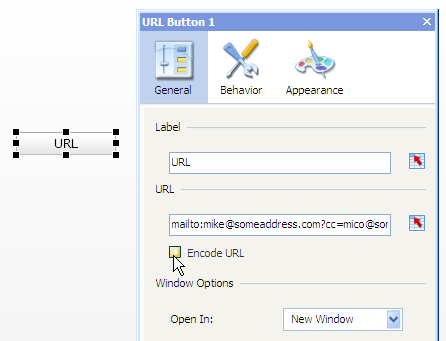 And as always, you can dynamically build your mailto url address in Excel with formulas and simply reference it in the URL button. So what about that nasty browser window that pops up when you send an email from Xclesius? You can get rid of it by changing the “Open In” option to ‘This Window’. After doing this, the extra browser window doesn’t open when you export your final SWF and HTML. You’ll still see it when you are in Preview mode, but rest assured, it will be gone when you go to run-time. There you have it! Happy emailing! Ok people. Get ready to get excited. As of November, I will be offering free webinars on a variety of topics. 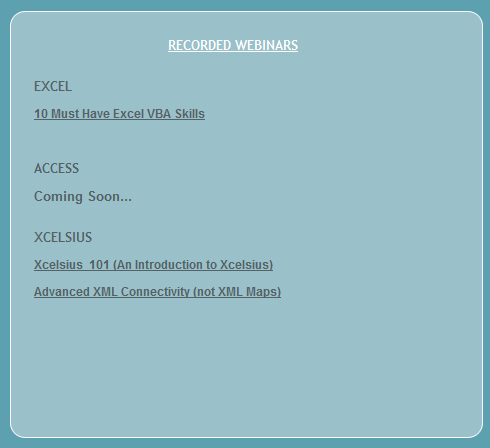 This session is a Beginner’s look at Xcelsius. If you or someone on your team is just getting started with Xcelsius, this session will give you a proper introduction to all the features of this amazing dashboarding tool. 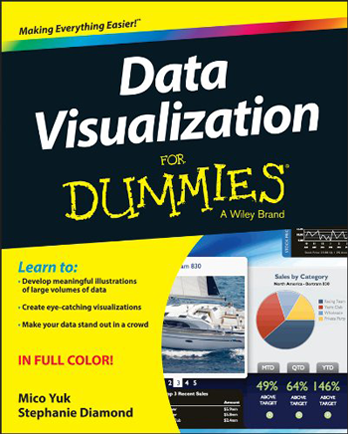 Join us to learn a few of my world-famous tips and tricks that will help you enhance your Xcelsius dashboards. In this Webinar, you will learn how to connect to external databases using full XML connectivity (Not just XML Maps). This session will walk you step-by-step through the code you will need develop a connected Xcelsius dashboard. Click Here to Register for any of these FREE webinars. I wanted to drop a quick post to let our community know that due to an overwhelming request, we have decided to hold another session of our Xcelsius Advanced Developer Workshop. Sign up before September 1st and get 25% discount off registration! By the way: Leading up to this event, I will be posting some cool new tips and tricks here, so stay tuned! Have you ever created a Line chart, then decided you needed a Column chart? Making the switch between chart types is easy in Excel, but in Xcelsius there is no way to quickly change chart types. You simply have to start over. That means adding a new chart to your canvas, re-doing all your configurations, an apply the formatting as needed. Well in this video, I show you how a simple charting best practice and save you tons of time and energy. Did you know that you can add colors to your custom number formatting in Excel? Not only that, but you can leverage Excel’s custom number formatting to add color to all kinds of Xclesius components. I recently produced a video demonstrating how to apply colors to Y-Axis labels based on simple conditions. This is an easy way to add another layer of analysis to your charts without adding overhead to your Xcelsius dashboards.